Jeanne Callanan, who recently received her MA (Distinction) in Conservation, travelled to Paris earlier in September, to give a paper at the LACONA XII conference. The LACONA conference (Lasers in the Conservation of Artworks) is a series of congresses begun in 1995 which are devoted to the application of lasers for cleaning artworks, the use of lasers as analytical tools and achieving a better understanding of the impact of lasers. 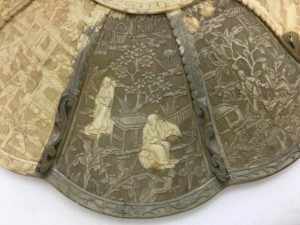 Jeanne’s paper, “Lasers and Ivory: An Analysis and Case Study”, presented the results of her conservation treatment of a nineteenth century Chinese ivory lidded basket and of her research on the effects of the Nd:YAG Q-switched (1064 nm) and Er:YAG (2940 nm) laser systems on ivory. 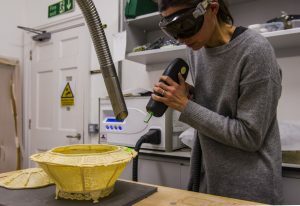 The conference was an excellent opportunity for Jeanne to showcase her work and to meet other conservators from Europe and America who are using lasers in their practices. It was also a chance to showcase the important work being undertaken at the Art School on an international stage. Jeanne was our very first MA Conservation student, and came to the Art School with an impressive academic and professional portfolio. She already has an MA (Distinction) in History of Art and Archaeology from SOAS, University of London and has worked for Sotheby’s New York as a Specialist in the Indian, Himalayan and Southeast Asian Art Department, the National Gallery and the V&A Museum. The research Jeanne undertook for her MA Conservation focused on comparing the effects of different laser systems for cleaning ivory. 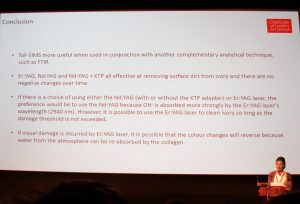 She used Time of Flight Secondary Ion Mass Spectrometry (ToF-SIMS) in the Materials Science Department, Imperial College, to analyse changes to the surface chemistry of the ivory after irradiation and Fourier Transform Infrared (FTIR) as a complementary analytical technique. 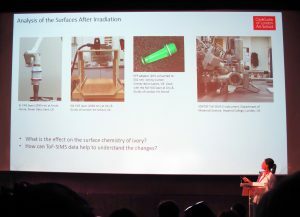 The Art School acquired the state-of-the-art Nd:YAG Q-switched (1064 nm) laser in 2008, and is the only UK conservation teaching institution enabling students to investigate important new cleaning techniques using this technology. 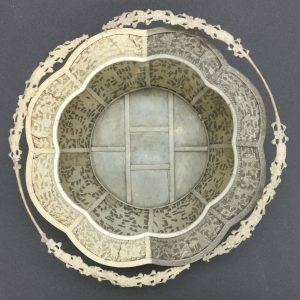 The exquisite, Chinese, nineteenth century ivory basket used in Jeanne’s research project is from the Portland Collection, and is just one of the historical objects loaned to our Conservation Department for conservation projects. We have built up an impressive list of collaborators, both public institutions and private collectors, who regularly loan objects on this basis. Many collaborators also offer internships, work placements and live commissions, which provide essential professional experience for our students. We’re very proud of Jeanne’s impressive achievements and will follow her career with interest as she continues to excel in the heritage sector.